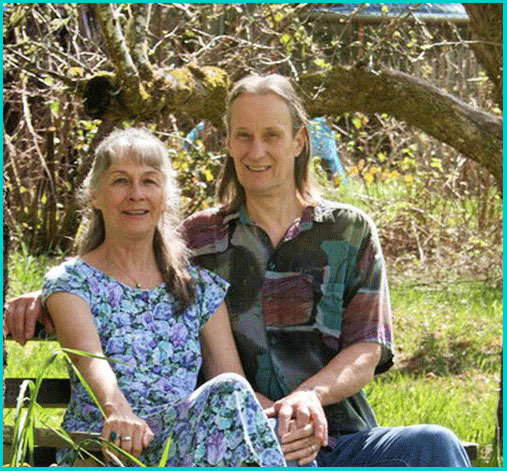 The artists, Jeffrey Howard Straw and Iris, his wife and inspiration, have called the Big Island of Hawaii home for over 25 years, and have recently relocated to Redwood Valley in Humboldt County, Northern California. The Straws surround themselves with beauty and have found a unique method to recreate some of this beauty and magnificence that is truly magical. They have created a composit of pictures forming lush dreamscapes and beautiful sacred imagery that allows one to be lured and drawn into this fantasy paradise again and again, each time to discover yet another new and previously unseen pathway to please, delight and intrique the viewers eye. Much of the imagery in these works is reflective of the lush greenery of a tropical paradise and also the colors and beauty of the Southwest. Through this creative process Jeffrey & Iris are able to share this incredible vision with the world. Their work has been exhibited in galleries and one man shows in Hawaii, on the west coast and Southwest United States and can be found in private collections around the world. The artists invite you to own a piece of this inspired artwork for yourself. To create these beautiful works of art, the artist uses scissors and cuts images from magazines, calendars, books and periodicals containing high gloss, high resolution images. The cut images are then glued to a prepared masonite board using many overlaping images to achive the seamless effect. From this stage they are photographed using the most up to date digital camera.The digital process used here creates a sharp, clear enhancement of the image itself. At no time in the creating of these works of art are the images manipulated by any computer process. These works of art are all created by hand by the artists. Our mission statement is that we love beauty. energy and improved fung shui of their environment and lives that beautiful surroundings provide. We believe that everyone should be embraced and nurtured by being surrounded by beauty. Please contact us if you think that some of our art can help you in further achieving this goal in your life. A fantasy artform unlike any other.